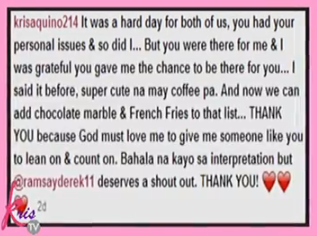 April 4, 2014; On a morning show "KrisTV" aired on Friday clarified that Kris Aquino and Derek Ramsay are just friends. It was Kris who explains further the meaning of her instagram post related to Ramsay last Tuesday. As the rumors of blossoming romance between Derek Ramsay and Kriss Aquino burst out online which started late March 2014, netizens asked Kris for more details and it was granted emphasizing that they are just friends during KrisTV episode on Friday, April 4. The speculations that they were on deep mutual relationship started after Ramsay posted a photo of him with Aquino on his Official Instagram account which has since been deleted. The image posted showed the two having drinks one night and Derek inputs in the caption called Aquino "the funniest." We know showbiz world is always looking for new and interesting issues as a result netizens has been speculating on Kriss Aquino's love life, since she admitted she was "in love" again. The question is still there; Who is that person Kris said she was in-love? Keep updated in our future blog post for more updates about Kriss Aquino.